One more year, and time to speculate once more! First, here's a 2014 year summary. On the CPU front, Intel barely budged this year. Intel Haswell (4th generation Core i3 / i5 / i7 chips) remains the state-of-the-art. The Broadwell update did indeed technically deliver in 2nd half 2014, but only in the much down-clocked energy-efficient CoreM series (available only on certain tablets). 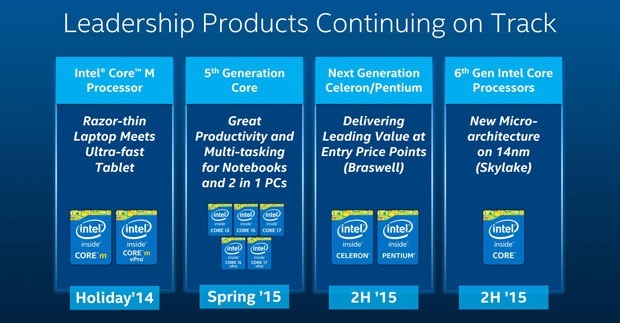 Intel continues to delay the Broadwell update for typical laptops to "Spring 2015". If Skylake delivers on time, then Broadwell will be obsoleted in only a few months. Intel did technically update their Haswell line with "Devil's Canyon" chips. But this was neither an architectural improvement nor a die shrink. No major gains on performance were found here. Intel's low-power front held steady with their "Atom" line. The only major progress this year however is Intel's rebranding efforts, where Intel Atoms are no longer simply called "Atoms". Atoms can be called "Atom", "Celeron", or "Pentium" now, which is quite confusing actually. (Celeron / Pentium can either refer to Haswell or Atom chips... which have extremely different performance / power characteristics). Nonetheless, the "Bay Trail" Atoms are a mild success, with tons of 7-inch and 8-inch Windows and Android Tablets using the Atom. If you're buying a $100 to $400 device powered by Intel anytime soon, chances are its running the Atom. AMD delivered their "Kaveri" line of "APU" chips in both laptop and desktop form. Their big-core AM3+ Fx-series of chips had a very minor update with a 100MHz clock boost, but there were no architectural advancements here. 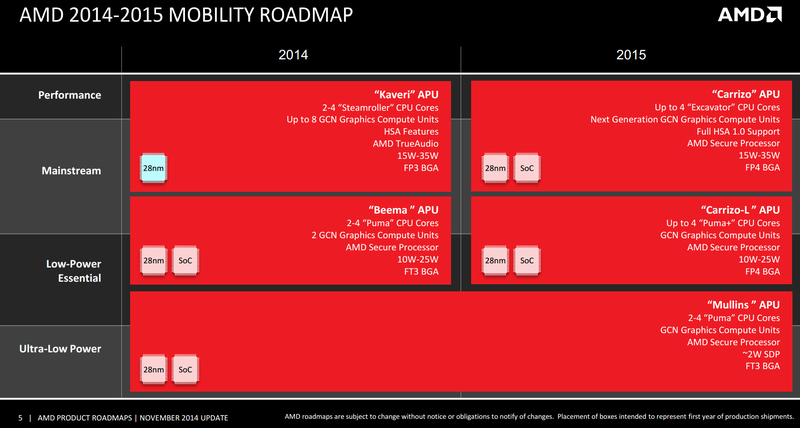 AMD Kaveri Laptops seem to have only been released in lower-power ~19W laptops form factors. The 35W AMD Chips don't seem to exist anywhere... but this might be due to the market conditions favoring the thinner lighter style of laptops. But, what was missed on the CPU-front was easily made up on the GPU front. AMD released a new mid-tier card R9 285 to replace the R9 280 (rebranded 7950). And furthermore, massive price drops started to occur around September 2014. NVidia vs AMD is all set with these massive price drops, kicking the R9 290x down to $300... and NVidia releasing the top-quality GTX 970 for $350. (The GTX 980 sells for $550 but isn't considered nearly as good of a deal as the $300 stuff). For the R9 290x which was selling in Febuary 2014 for $900+ (Litecoin miners caused a shortage), seeing a $600 price swing down to $300 was quite exciting indeed. As for other components... the MX100 has brought SSD prices even further down, crushing the $0.50 per GB mark. So, what's ahead for Intel? * Broadwell: Standard Laptops / High end Tablet chip. Maybe it's gonna finally launch damn it!?!?! Intel is reaching almost 2 years without a real desktop update. * Brasswell, despite the "well" name is a low-power Atom-line. * Skylake will be the new architecture. But with Broadwell only having a few months, maybe Skylake will be delayed as well? For AMD, they plan to release Carrizo lines (a high-powered line with Excavator, and a low-powered line off Puma+) next year, along with ARM chips for the low end. Maybe AMD will get some ARM tablet wins? Carrizo will be competing against i3 / i5 / i7 chips, while Carrizo-L will be competing against Atom / Celeron / Pentium. An important note for AMD is that their Carrizo and Carrizo-L chips look like they run off the same socket. Carrizo will also be an SoC design (according to slides), which ought to make things cheaper to say the least. For GPUs, the best is yet to come. AMD has their R9 390x series to come some time next year, and NVidia's die-shrink is imminent. The GTX 970 and GTX 980 are rumored to only be stop-gaps for the next generation. As for AMD's R9 390x, they are advertising liquid cooling beast of a chip. I'm curious as to the benchmarks and power-consumption of that thing. I don't think a single-chip card has ever had a reference liquid-cooler before. As for other components, here are rumors. * Sony and Panasonic are working on a next-generation 300GB to 1TB optical disc called the "Archive Disc". Unlike previous years, there will not be any format wars! The big disc companies are working together on this one. The current expected release is "Summer 2015". Is it time for optical discs to make a comeback? * NVidia GSync monitors are currently available... for a cost premium. But Samsung has confirmed complete support of AMD's "FreeSync" (aka: DisplayPort 1.2a standard Adaptive Sync), with multiple 4k monitors launching with FreeSync support in March 2015. Adaptive-sync allows the GPU to update the screen, instead of the screen "pulling" data from the GPU. This reduces tearing and leads to far smoother experiences for games and media. Only certain AMD Graphics cards (R9 290x, R9 290, R9 285, and R7 260x) will support FreeSync. Older cards (and even some recent cards like the R9 280) will not support FreeSync. Nvidia cards will only support GSync. So "Monitor Format" wars are beginning. * I'm beginning to notice the new M.2 SSDs in stores... in laptops and in motherboards. This small SSD form-factor is going to be the future, and I suggest making sure your motherboard purchases are future-proofed for M.2 support. First: shouldn't this be the Winter 2015 Laptop/Desktop/Tablet/fitwatch Speculation? On GPUs: AMD seems to be happy with smaller chips at a less expensive "sweet spot". Maybe they want nvidia's less price sensitive customers, maybe stacked DRAM makes bigger chips make more sense (I suspect both). I doubt I will be willing to cough up for a 500mm chip. As far as watercooling goes, boards have been banging against pci-e specs limiting the amount of heat used by a card. I suspect this is mainly a way to put more power in (pretty much everything but the weakest cards and the hyperefficient 950 need power connections) and pull heat out. For those interested in VR: Occulus' current "official leaked" specs seem to >1080 and optimized for 90fps (for latency), so expect to need some serious pixel shading power before donning VR shades. Even then the shear arc the resolution is stretched over is huge (read even 1080 looks like low-rez), early adopters should expect to replace theirs the moment something can generate scenes with variable resolution centered on your meniscus. "NVidia's limited rollout". They already "used up" one of the missing numbers: 960 is used for [mobile-only?] GPUs for 950s with GDDR[5?] memory. Since this seems to be their "sweet spot" in terms of price, I'm guessing that the next "real x60" will be on a different process. Another "missing chip" would be the all out double precision supercomputer chip. Since they just released a dual-processor compute board, I'm not looking for another "compute chip". Hopefully the missing chips will be shrunk and ready soon. Note that rumor has it that AMD will be releasing chips on TSMC's 20nm node, with nvidia waiting until the 16nm node. I assume this means that delayed chips won't be out until well after AMD, but presumably nvidia expects the next node quick enough to skip one. Archive disc. I'll believe it when I see them in Microcenter (preferably with discs running at lower TB/$ than 3TB SATA drives). EETimes mentioned that they will/are using Reed-Solomon encoding, which sounds extremely silly (maybe they went whole-hog and did 16bit, but I really don't think that makes that much sense). G-sync vs. Freesync: This is one of those "how long does it take the graphics industry to realize that there isn't any analog in the whole stack?". While I have noted my doubts about the importance of such (and have trouble understanding how anyone could see it until it starts to "beat" by repeated tearing in the same spot), it is seriously bizarre that graphics and display insist on separate buffers and filling of each. Next up: when will we realize that pixels haven't had more than one color since roughly 2000? HINT! we aren't using CRTs any more. Pixels should either be single color (like RAW camera images) or YUV. PS. This type of thing (Gsync/Freesync) is likely to be huge in VR (although the "original consumer occulus rift" won't support either). Expect VR to want to grab control of the display "line by line" instead of "frame by frame". I've seen Dell Ultrabooks with M.2 "drives" in SATA adapters. Things look like they are switching over. I write these speculation topics because people tend to buy in Summer: the "Back to School" sales. So what I'm speculating upon is usually lined up for that time-period. Black-Friday / Winter deals aren't often with "new" stuff, but is typically about slightly-dated stuff at very good prices. So summer-speculation is usually where its at as far as new-tech goes. The slowing pace of CPU innovation is going to make these newer sets of computers last much longer. No longer do we have to worry about obsolescence every two years (like in the early 2000s). So its somewhat sad that CPUs aren't getting churned out as quickly... but its also relieving from a wallet perspective. Hopefully the missing chips will be shrunk and ready soon. Note that rumor has it that AMD will be releasing chips on TSMC's 20nm node, with nvidia waiting until the 16nm node. I assume this means that delayed chips won't be out until well after AMD, but presumably nvidia expects the next node quick enough to skip one. I'm actually hearing that the 390x is going to be released at 28nm, due to complications at 20nm. Apparently, Apple bought out TSMC's entire 20m capacity on the iPhone6, so neither AMD nor NVidia get 20nm until Apple is done making iPhones. It sounds like NVidia will get the die-shrink to 16nm first, while AMD is instead doubling on its R&D efforts with HBM Memory instead of working with the die-shrink. It might very well be 28nm + HBM AMD cards vs 16nm NVidia cards. The G-Sync / FreeSync thing is going to be the reason for me to get a monitor upgrade in almost 5 years. 1080p is good enough, and honestly the TN / IPS / whatever panels weren't that big of a deal to me. (Accurate Color representation? Bah, its about frame-latency, and TN panels are best at that. IPS is a "sideways" market move, not an upgrade. You get better colors at the cost of gaming performance). I really wouldn't make big bets on Apple letting you have the first crack at the next node either. I'm also boggling on the idea of a 500mm chip. Presumably that is TSMC's maximum size (I forgot the limiting factor, but it's around there. Used to be smaller). I've assumed that the Titan couldn't be profitable if it weren't for the supercomputer business buying the same cards at 4-10x time price (with a few special functions such as ECC and fully unlocked double not found in consumer cards). On the other hand, I wouldn't go assuming it would be any cheaper on 16nm (at least for a few years). Lets see, CES has come and gone (early January). Here's a summary of news events that I remember. * The GTX 970 has 4GB of RAM on board, but effectively can only use 3.3GB at full capacity. For me, this isn't a major deal (4GB is enough for 1080p gaming), but for those with higher-resolution monitors or multiple-monitor setups, the GTX 970 effectively gets hamstrung at 3.3GB instead. I can see why some people are pissed though, the card basically performs as if it were a 3.3GB card, not a 4GB card like advertised. * FreeSync monitors have been advertised well at CES, but as of today... I can't find any on the market yet. A good variety of FreeSync monitors have been promised from LG, Samsung, BenQ, Nixeus, and ViewSonic. I personally have my eyes set on the LG ultra-wide 2560x1080 monitor... but I'll await reviews (and erm... the price tag) before jumping on board. * USB 3.1 made some rounds in CES this year. 100W of power, 10gbps (twice as fast as USB3.0), symmetric plug, Display-port compatibile... it seems like USB 3.1 is truly a revolutionary "do everything" upgrade of USB. * New SSD models have been announced for this year at CES. The MX200 and BX100 from Crucial / Micron are cutting prices yet again in the next generation. For the near future, I expect SSDs to continue to decline in prices as these newer, cheaper models come out. * For those where current SSD performance is not enough, M.2 and Sata-Express have made a splash at CES. Western Digital has a nice SSD/Hard Drive hybrid that runs off of Sata-Express. * M.2 Laptop SSDs vs Sata-Express (backwards compatible) Desktop SSDs. For PC chips specifically, there honestly isn't much news. Its mostly peripheral upgrades. Monitors, SSDs, USB3.1. If I were to guess what this year is big for, it'd be a big year for a phone / tablet upgrade. ARM's new cycle of chip designs has started to come out. Qualcomm's Snapdragon 810 (20nm) is out right now, and some phone designs are coming soon. Qualcomm's Snapdragon 820 (14nm) and Samsung's Exynos 7 (14nm) will continue the pace of phone improvements. Microsoft announces Windows 10. Its a free upgrade to all those with Win7 and up. Its free on Raspberry Pi 2. It will have a package manager built in and multiple-desktops (features borrowed from Linux). Honestly, it looks pretty good. Microsoft has also finally released MS Office on iPad and Android.